It is very rare that I read a book that sweeps me away into its world and touches my very soul with its story. 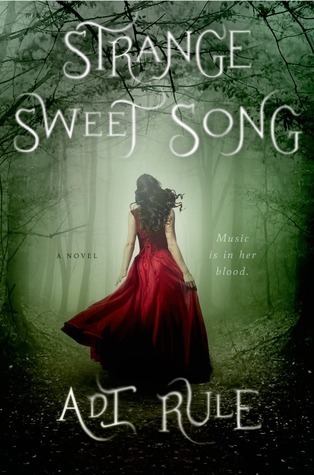 Strange Sweet Song is one of those rare books. This is one of the most beautiful stories I've ever read. Reminiscent of a modern-day Bronte sister, Rule's writing is almost poetic in its beauty. The contemporary Gothic world she created is described in lush detail, and the reader can't help but immerse himself or herself in the lyrical prose. The characters in this novel are both modern and classic. They have an air about them that most contemporary people don't have, and I think that Dunhammond being set in the middle of nowhere, with technology having to be abandoned due to no internet access or cell phone reception, really helped the gothic feel of this novel. Instead of playing on computers and texting their friends, the characters had to find other ways to entertain themselves. The addition of classical music made this a beautifully haunting Gothic tale. Sing, whose name I'm not a fan of, is a complex leading character. She is weak at times, and her voice reflects her inner turmoil. It takes her a long time to find her voice and a long time to find herself. In a large way, this story is Sing's coming of age tale. Furthermore, Sing's name has a deeper meaning. She wears it like a command, and feels that she has no choice but to sing how and when people want her to. The depth of her name choice is reminiscent to the great Gothic writers' ability to add layers of meaning to every word they wrote. The other characters each stand on their own as well, and while some are typical (Ryan and Lori, for instance), others are intriguing (Nathan). The mixture of typical and unique character gives the story a sense of reality that many books lack. Even The Felix and Tamino stand out. I, personally, adore Tamino. Romance takes a backseat in this book, but it is present. The novel really illustrates the different types of love that one person can have. Love for music, love for nature, love for parents, love for oneself, and love for significant others all compete in this book. One of the main questions Strange Sweet Song raises is can one person have everything? Is anyone allowed to have all of their loves, or must everyone sacrifice at least one love for the sake of the others? I think the answer to this problem ends up being a bit ambiguous, and the reader is left to decide for himself or herself. My favorite thing about Strange Sweet Song is that it makes you think without being too heavy. The story itself is enjoyable, but there are so many questions and deeper meanings woven into the fabric of this tale that one can't help but question his or her own reality while reading this novel. Because of that, along with the lovely prose, wonderful characterization, and captivating world, I would recommend this novel to anyone who is looking for a bit of a change. This is one book that will definitely get you out of any reading slump you're in.